When life gives you lemons, you make lemonade. 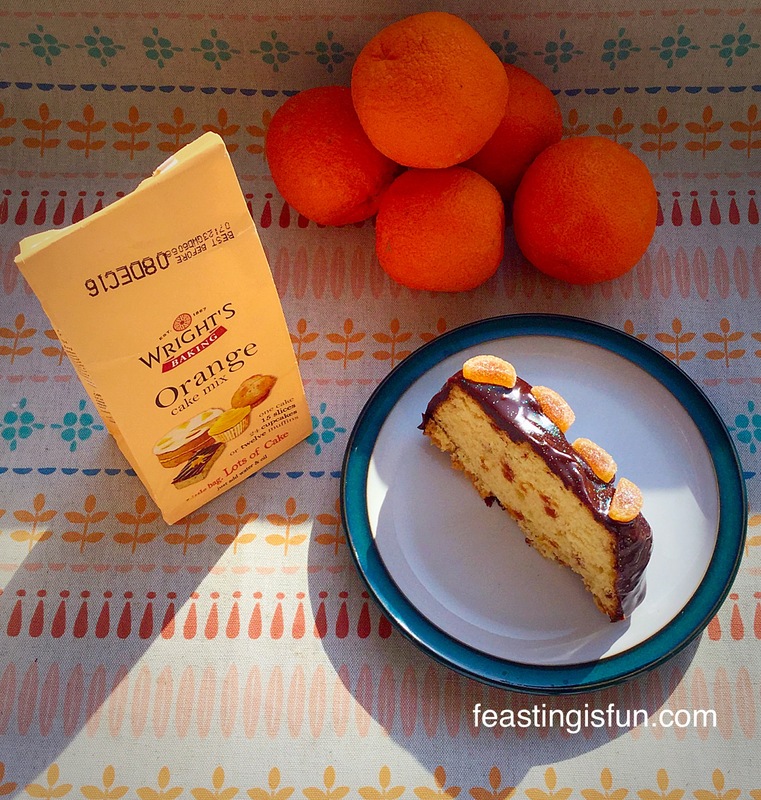 What about when a delicious new orange cake mix from Wright’s Baking arrives? 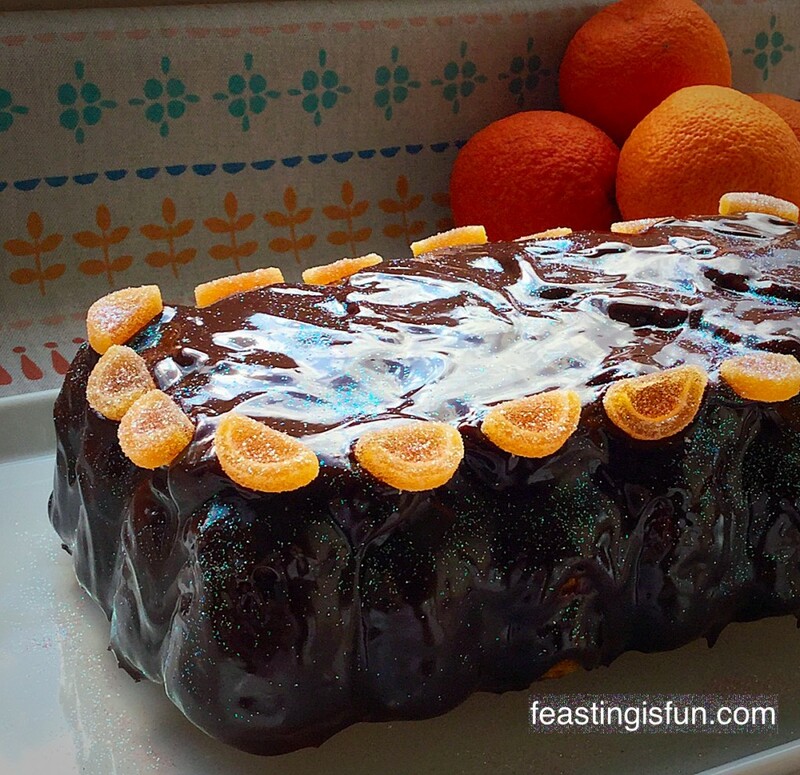 You make a Chocolate Orange Citrus Bundt! 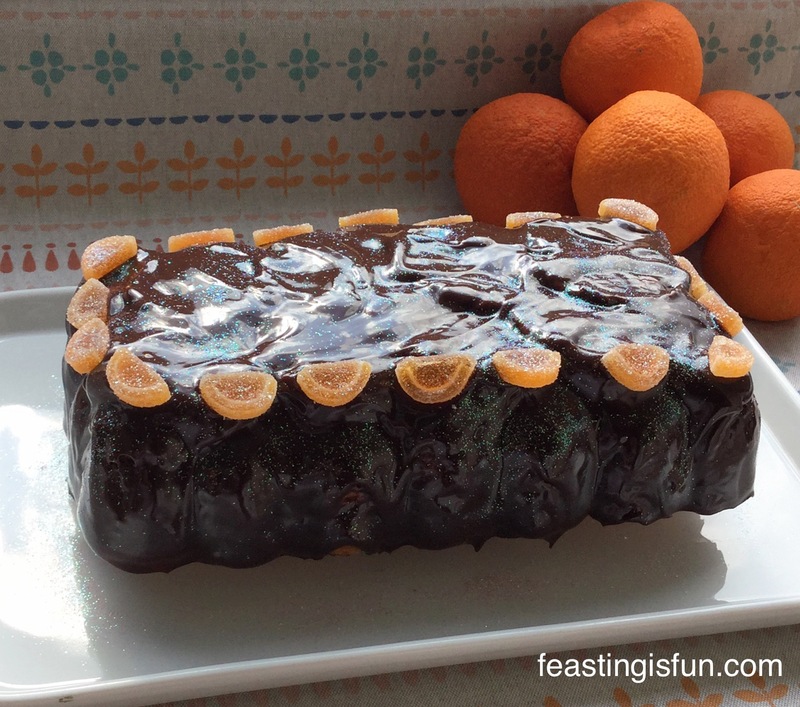 Chocolate Orange Citrus Bundt delicious orange cake smothered in chocolate orange ganache. The lovely people at Wright’s sent me an orange cake mix completely out of the blue! 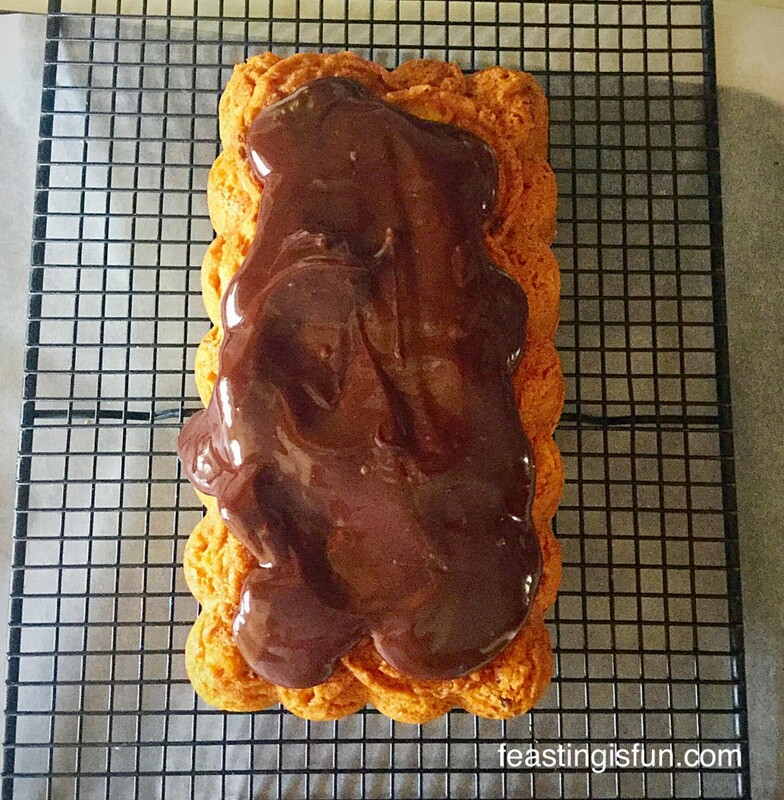 I knew their toffee cake mix had been a big hit with my Toffee Banoffee Waffles and didn’t hesitate coming up with ideas of which cake to make. There was only one, rather large problem – I am allergic to oranges!!! Our son, on the other hand, absolutely loves them, as does my hubby. So I set my mind on making an orange bundt cake, baked in the beautiful citrus Bundt tin that I used for my Glazed Lemon Bundt Cake. I had been wanting to bake an orange cake in the tin and this seemed to be perfect timing. 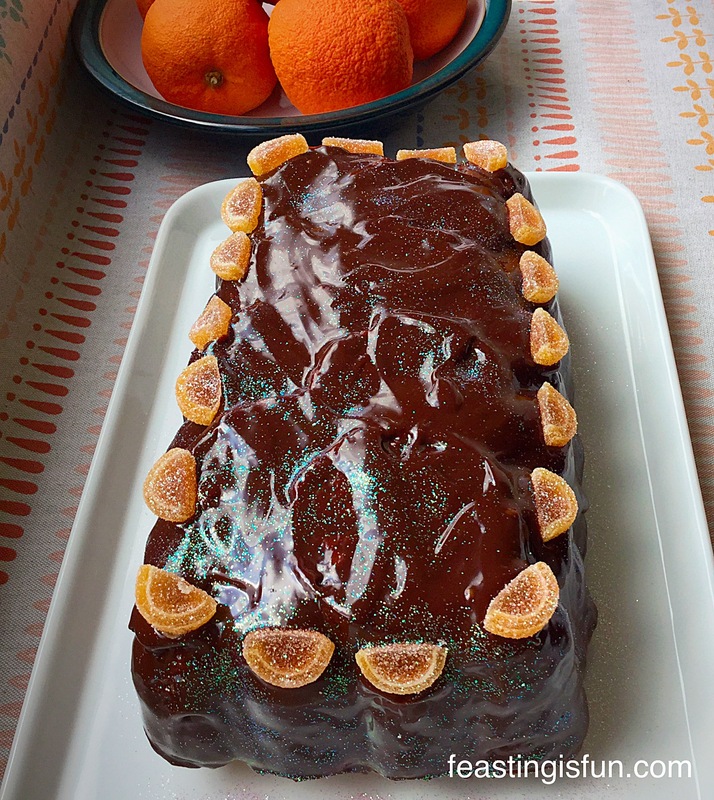 On this occasion I wanted to drape the orange cake in a chocolate orange ganache. Chocolate and orange are an awesome and classic flavour combination. Just because I cannot eat it (see Migraines) shouldn’t mean others must miss out. Chocolate Orange Citrus Bundt utterly delicious cake. As regular readers will be aware, the majority of my recipes are made from scratch. However, I do believe there is a place for good quality, packet mixes in our kitchens. Where would my Ciabatta Base Pizza be without a ciabatta bread mix? Just before Easter, after I had baked two batches of differently flavoured hot cross buns and a batch cookies, I realised that we were nearly out of bread. I simply didn’t have any energy left to weigh out even the simplest of ingredients. It was utter relief to add water to the bread maker, tip in a packet of Wright’s mixed grain bread mix and press start! Having a cake mix to hand, especially when baked in a beautiful Bundt tin, means that you are only a quick whisk away from having a cake baking in the oven. Perfect for when guests drop by unexpectedly or someone has a birthday that you’ve almost missed. There are a million reasons why it’s ok to have a cake mix in the cupboard and one of them is so you can make this Chocolate Orange Citrus Bundt cake! Optional – orange jellies and edible glitter to decorate. Method: You will need the Citrus Bundt Tin by Nordicware to make this cake – alternatively a loaf tin would give a pleasing shape. Preheat the oven to 165C/150C fan, gas Mark 2. Make the orange cake batter according to the packet instructions. 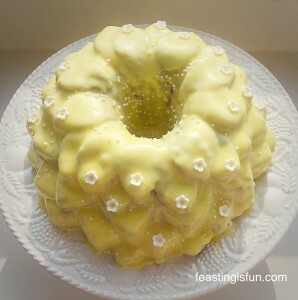 Spray the Citrus Bundt tin with cake release spray – if using a loaf tin, grease and line the base with baking parchment. Spoon the cake batter into the prepared tin. Place in the middle of the oven and bake for 45 – 50 minutes. The cake is cooked when it is golden brown and an inserted skewer comes out clean. Once cooked remove the cake from the oven and allow to cool in the Bundt tin for 10 minutes – allow to cool completely if using a loaf tin. Turn out the Bundt cake onto a cooling rack. 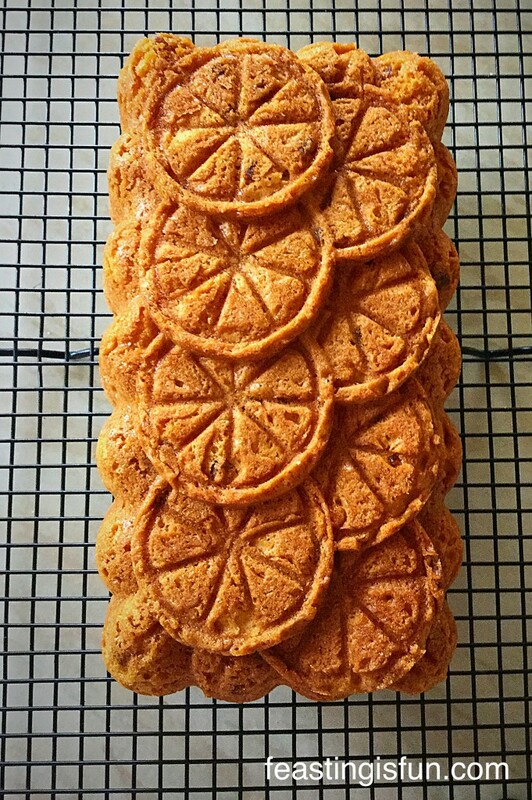 This Orange Cake looks beautiful with the intricate Bundt tin markings. Allow the cake to cool completely before covering with the chocolate orange ganache. Break up the chocolate and place into a heatproof bowl. Place the bowl over a saucepan of barely simmering water, the bottom of the bowl should not touch the water – this is called a double boiler see Chocolate Sparkle Cake for step by step photos. Stir the chocolate and cream constantly until the chocolate has melted. You should have a nice smooth ganache. If you wanted to make this cake for adults, the addition of one tablespoon of Grand Marnier, stirred through the ganache, would give it a delicious, boozy edge 😉. Place the cooling rack across the baking tray, ensuring the cake is cold. Spoon the warm chocolate orange ganach over the top of the cake. Spoon the chocolate orange ganache over the orange Bundt cake. Continue spooning the ganache over the cake, encouraging it to drape over the sides. Once the cake is completely covered, allow the ganache to finish dripping for a further 5 minutes. Add the orange jellies and edible glitter, if using. Now take a photo of your wonderful creation!! 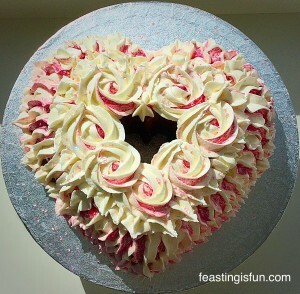 Ooh and give yourself a pat on the back for baking and decorating such a beautiful, delicious cake. Allow the cake to set for approximately 30 minutes. During warmer weather it would be advisable to put it into the fridge. Once set, slice the cake and serve with a nice cup of tea of coffee. Or maybe a liquer coffee if you added a little tipple to the ganache!! Chocolate Orange Citrus Bundt made with Wright’s Orange Cake Mix. 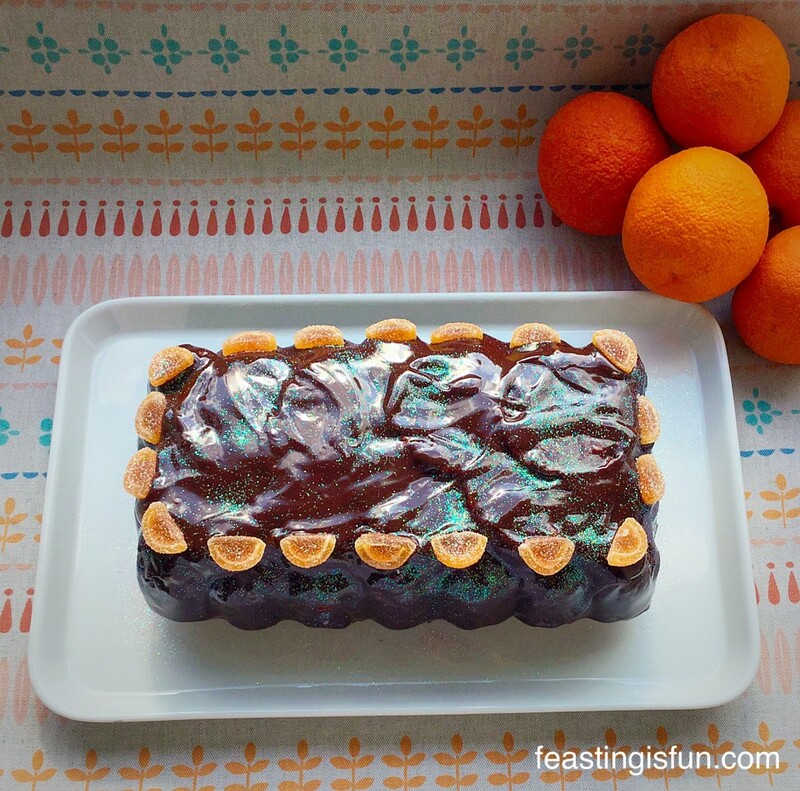 This Chocolate Orange Citrus Bundt is a top class cake. As you can see from the photo, pieces of dried fruit are distributed evenly throughout the cake, which has a moist, tender crumb. There is no shame in using a cake mix, as long as it is a good quality one – which this Wright’s Orange Cake Mix most certainly is. 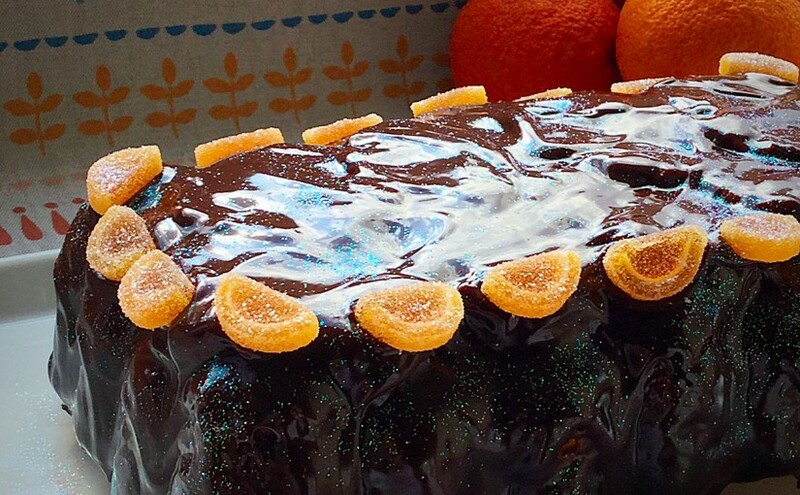 Chocolate Orange Citrus Bundt who will you share your cake with? Do you use cake mixes, or are they banished from your kitchen? 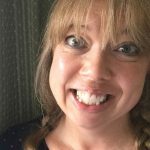 Has my post made you reconsider using a cake mix? I am not being paid to ask these questions, I am genuinely interested in what you think and also just a touch nosey 😉. As for me, am I suddenly going to only use cake mixes? The answer to that is no? Like everything in life, it is about balance. I make most our bread from scratch, yet I have a loaf of white sliced ‘plastic’ bread downstairs as I’ve been unwell for a couple of days. There is most definitely a place in my kitchen for mixes, for all manner of different reasons. The act of baking or cooking something, for me is calming and therapeutic. For someone else, the mere thought of making a Victoria Sponge Cake may stress them out to the point of not starting. So I say, in that instance, as I said for my Chocolate Amaretto Cake use a good quality cake mix. Better to try with some hope of success, than abstain for fear of failure. 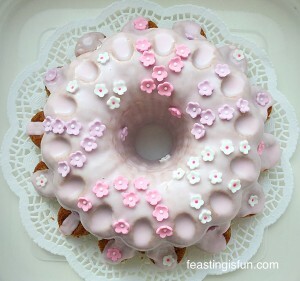 Flower Vanilla Bundt Cake perfect for celebrating the safe arrival of a baby girl. 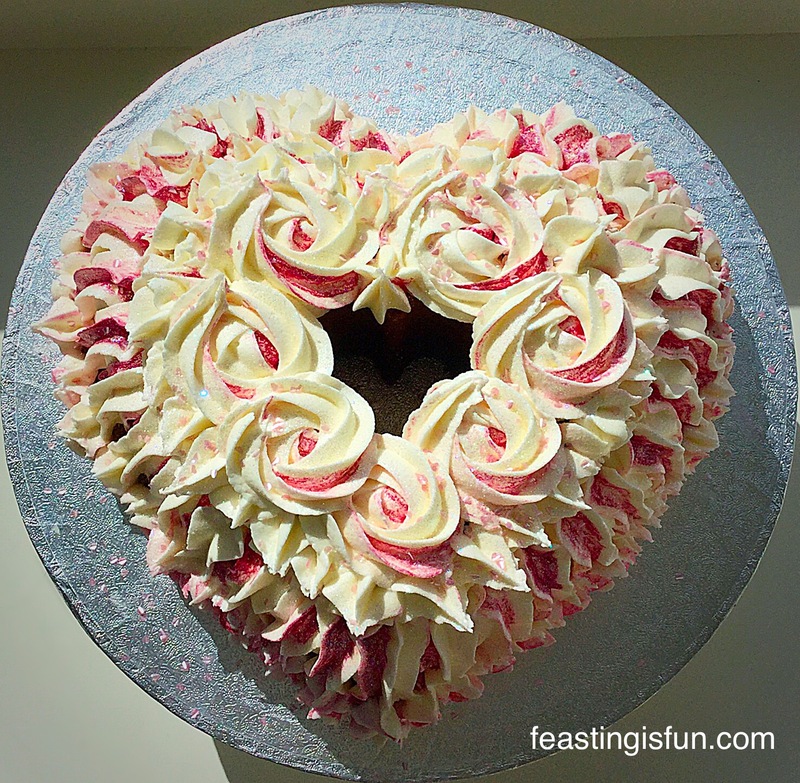 I am available on Twitter most days and am more than happy to help guide you through your bakes. Whilst not professionally trained I have been baking for forty years and belong to a wider baking community of like minded bakers. Together we can usually solve a problem, avert potential disasters and generally encourage you no matter what level of cook/baker you are at. Personally I also thoroughly enjoy seeing your kitchen creations, whether it be a meal, cake, loaf of bread or anything else. Please post a photo on Twitter/Instagram and tag me in? I’ll be sure to give you a shout out or retweet! Wright’s Baking supplied the orange cake mix for this recipe. All opinions, views, content and photographs are my own. I was not paid to write this post. Please see my Disclosure Policy . – cooking with MY Maya Gold??? Perfect! – and secondly you mention that cooking can be therapeutic, but that the idea of cooking a Victoria Sandwich can be stressful to others. It brought to mind a chap I was with at work last month. As you know, I work with people who either can not see a future for themselves, or the idea of the future is too painful for them. This particular gentleman disclosed to me that he had attempted to take his own life and was planning on doing so again, and that he now had the means to succeed. He had not planned on telling me, and this disclosure came as much as a surprise to him as it did to me. Such an honour but also a responsibility to receive such information. I put all of the support in place for him that was at my disposal and planned to see him in 3 days and then a week later. Well, a week later he returned. He was much more upbeat, having verbalised his dark thoughts for the first time and also knowing that specialist support was now in place for him. In particular, he told me that the day before, he had woken at 5am unable to get back to sleep again. Whereas before he would have lain awake, with his anxiety levels increasing, this gentleman went onto the internet, found a recipe for a Victoria Sandwich and made his first ever cake. In fact, the first thing he had ever cooked in his life. His wife woke to the smell of baking and he spoke to me with incredulity that you take flour, sugar, butter and eggs – and make a cake??? ?